Exclusive Vacation Home that offers you more than you bargained for! This is a beautiful Santa Fe Authentic home located just a few mintues drive to the Santa Fe Plaza! Read the reviews to see what other guests have raved about on this home! You will love your stay in this property!!! 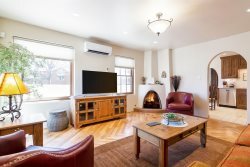 It is nestled in the pines under bright blue skies and clear starry nights, you will find this beautifully appointed, authentic Santa Fe style home. Southwestern décor, high-beamed ceilings, and Saltillo tile floors are some of the many features of this lovely home. Its location is close to restaurants, art galleries, museums, and hospital, with fast, easy access to both I-25 and I-40. The famous Santa Fe Plaza and downtown attractions are a quick 10-minute drive away. There are two bedrooms and two full baths with a generous walk-in shower in the master bedroom. Each bedroom has a luxurious queen-sized bed, one with a Tempur-Pedic mattress and one with memory foam. In the utility room is a washer, dryer, ironing board and iron. The kitchen is fully equipped with modern appliances and all the amenities you need to prepare meals or grab a snack. A family dining room is just off the kitchen with a table that seats six. The sunken living room boasts a traditional, wood burning Kiva fireplace. For your convenience, a mix of piñon and cedar firewood is stacked right outside the back door. The couch in the living room opens into a queen-sized bed with gel mattress. The house sits on two acres of private, gated property with one adjacent house, and has a two-car garage complete with a rack to stow your skis and snowboards when not in use. After a few hours on the slopes, shopping or sightseeing, you can relax away from the activities of the day in the serenity of this newly remodeled house. You will experience the comforts of home, with the feel and fun of vacation. Enjoy the whole house. You can also utilize the outside grill and the backyard!